Apple's iPhone 8, iPhone 8 Plus and iPhone X have been on sale for a year now, and one of the biggest innovations with these iPhones, and the new iPhone XS, iPhone XS Max and iPhone XR, is wireless charging. Update: The Apple Event 2018 has been and gone and there is still no news on the AirPower. We aren't happy either about the no show and put pen to paper to ask, just what is going on? But, you need something with which to charge these, and your other Apple devices, right? To that end, Apple has created AirPower. 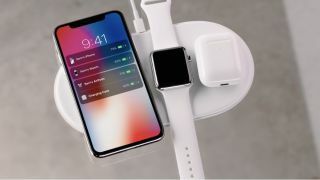 Shown off as a sneak peek during Apple's big event, AirPower is a wireless charging system that lets you power up your iPhone, Apple Watch 3 and AirPods, all at the same time. That's three devices wirelessly charging at once, a feat Apple has never achieved before. Of course, Apple hasn't invented wireless charging here (it's been around on Android for years), but Apple is bringing its own spin to the tech, and customizing it for its latest batch of devices. As demonstrated in a video, AirPower begins to charge your Apple products almost as soon as they are placed on the mat. The iPhone X screen displays the AirPower interface, providing easy-to-read updates on the battery life of your devices. Interestingly, the Apple Watch screen didn't display battery life info in the video. We imagine this is a feature Apple will introduce when AirPower is released, otherwise you'll always have to have your iPhone on the mat to get a reading. The heart of the AirPower system is a thin, oval-shaped pad. And, while only the AirPods (in their optional case) fit snuggling on its surface, your Apple Watch and iPhone will have ample elbow room. AirPower works with Qi charging technology, the leading wireless charging standard on the market. While Qi is available in third-party charging mats from the likes of Belkin and others, AirPower is Apple's proprietary solution to your new wireless charging needs. Apple Watch previously made use of Qi wireless charging, included in a pad crafted by Apple. However, AirPower allows for up to three different devices to charge at once, making it more open than Apple's previous effort. This is also the first time wireless charging is available for the iPhone, and this is thanks to the iPhone 8, iPhone 8 Plus and iPhone X's glass backs. But, AirPower is more than a mat; it's a whole wireless charging system that allows devices to communicate and manage power consumption between them. As Apple's head of worldwide marketing Phil Schiller said on stage at the announcement, this isn't possible with other wireless charging systems currently available. Schiller said, "We hope people love it, that it encourages others to create more advanced solutions based on technologies like this." Apple plans to work with the Qi standards team to bring AirPower's features to other charging solutions in the future, Schiller said. One major question about the AirPower system left unanswered is what the mat itself will connect to. There's clearly a wire coming out of one side, and it's likely AirPower will have a wall charger and/or USB to let you connect to a computer. It's also important to note that while AirPower offers fast charging, this feature will not work with the new iPhones. Instead, users can only fast charge over USB-C, which requires purchasing a USB-C to Lightning cable and USB-C Power Adaptor. Two key details about AirPower remain unconfirmed: price and release date. It was initially revealed in September 2017, but it may be a whole year later by the time you're actually able to buy it. Anonymous sources speaking to Bloomberg have said the wireless charging mat will come in September 2018 alongside a new range of iPhones. That has been backed up by a report from trusted analyst Ming-Chi Kuo too. We originally expected the charging pad to launch before the end of 2017 and then we heard rumors pointing to a March 2018 launch. That didn't happen though, so if you're waiting to buy one you may be waiting a bit longer. As for how much it will cost, chances are it will be expensive. Apple's original Apple Watch Qi charger cost $79 (about £60, AU$100). The fact this new mat charges more devices will likely up its price. In November 2017, a Polish ecomm site listed Apple AirPower as costing 999 Złotych, which converts to $274/£207/AU$356. But items that sell for that much on this particular site tend to cost $199, which would put the UK and Australia prices at £150/AU$260, respectively. We'll update this page as more details come to light.